My name is Jacelyn and I'm 12 years old. My favorite flavor of ice cream is cotton candy. They sell it at the ice cream shop downtown. I read Faceless by Alyssa Sheinmel. I thought it sounded very interesting and had a good message. Maise, the main character, had to get a face transplant and was longing for her old face. I liked when she realized that she was okay with herself and wasn't mourning anymore. I'd probably go through the same thing. I'd tell them what the book is about and that it has a great message. I think it's striking. It goes along well with the story. Yes, because it kind of leaves you hanging in the end and I want to know more about what Maise does. Does this relate to anything you've experienced? It's a story I wanted to tell for a long time. In fact, a while before my first book was published back in 2010, I began drafting some notes for a book about a girl who got into an accident that changed her face forever, who would discover how much of who she was was tied to what she looked like. Soon, I had pages of notes tucked away in the 'ideas' folder on my desktop. A few years passed, and I kept coming back to this idea - but I was never quite ready to start writing, never quite sure how I wanted to tell this story. 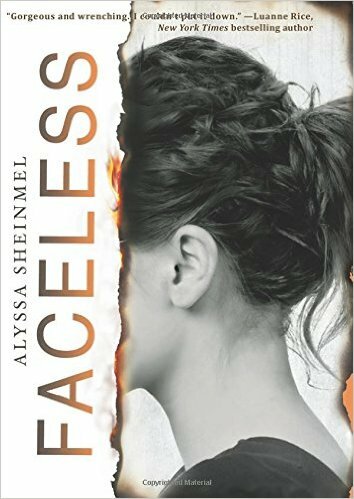 So when my American editor Emily Seife approached me about writing the story of a girl who'd survived a horrific accident, a girl for whom a face transplant was her best hope at having a normal life, I was immediately intrigued. I know it sounds corny, but I honestly felt like it was meant to be, like this was the story I'd been waiting to write. While on a run one day, Maise gets into a terrible accident. A hot-burning electrical fire consumes her, destroying her face. Where her nose, cheeks, and chin used to be, now there is... nothing. She is lucky enough to qualify for a face transplant. But with someone else's features staring back at her in the mirror, Maise looks -- and feels -- like a stranger. The doctors promised that the transplant was her chance to live a normal life again, but nothing feels normal anymore. Before, she knew who she was -- a regular girl who ran track and got good grades, who loved her boyfriend and her best friend. Now, she can't even recognize herself. Great interview! Are you intrigued to pick it up, Jo? TOTALLY!!! It's high on my TBR list!